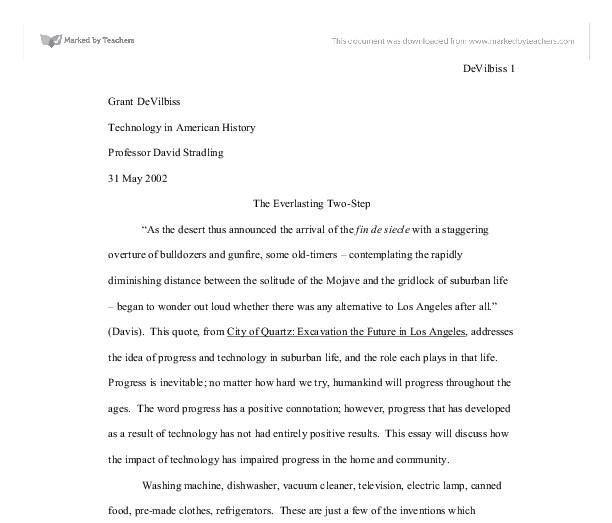 Grant DeVilbiss Technology in American History Professor David Stradling 31 May 2002 The Everlasting Two-Step "As the desert thus announced the arrival of the fin de siecle with a staggering overture of bulldozers and gunfire, some old-timers - contemplating the rapidly diminishing distance between the solitude of the Mojave and the gridlock of suburban life - began to wonder out loud whether there was any alternative to Los Angeles after all." (Davis). This quote, from City of Quartz: Excavation the Future in Los Angeles, addresses the idea of progress and technology in suburban life, and the role each plays in that life. Progress is inevitable; no matter how hard we try, humankind will progress throughout the ages. The word progress has a positive connotation; however, progress that has developed as a result of technology has not had entirely positive results. 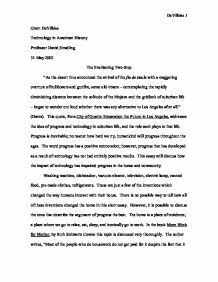 This essay will discuss how the impact of technology has impaired progress in the home and community. Washing machine, dishwasher, vacuum cleaner, television, electric lamp, canned food, pre-made clothes, refrigerators. These are just a few of the inventions which changed the way humans interact with their house. There is no possible way to tell how all of these inventions changed the home in this short essay. ...read more. Washing clothes was something that was done maybe once a month because of the all work that was involved in keeping them clean. Vacuuming the carpet would be impossible because there was no vacuum cleaner; moreover there was no wall to wall carpet to keep clean on a daily basis. Mowing the lawn would also be unnecessary because a beautiful, green, fertilized lawn that must be kept in good order was not an issue. A drive to the grocery store, wow, where to begin with what is wrong with that concept? First of all, there would have been no car to spend hours on end in traffic each week going from store to store. Even after the food from the grocery was purchased, there was no place to store it since refrigerators had yet to be invented. Most importantly, there was no canned food, TV dinners, or other pre-made storable food available. This is just a short list of the things that have changed over the years in a normal house worker's life. It is obvious to see that no matter how much easier one of these tasks became, another one or two would show up to fill the free time which had been created. ...read more. Since the automobile has become an integral part of daily living, the habits for interacting in a community have changed. Today houses have small to no front porch, large rooms meant, not for living, but for storing automobiles, and large back yards for playing away from the dangerous, busy streets where the automobile resides. Interaction with others is no longer commonplace but unusual. The only time neighbors see each other is when they are pulling their cars into the garage and before the garage door closes, keeping the seclusion even more prominent. It can be argued the things which have been described in this essay are a perfect example of progress. What was once impossible is now possible. What was once hard is now easy, but is it really? While technology of the past has changed life, it has not progressed it. For every step forward there is one step back. A step forward in saving time, a step backward in tasks to be done. A step forward in transportation, a step backward in social interaction. Technology and progress are forever caught dancing an unbreakable two-step danced to the "overture of bulldozers and gunfire." While the dance of the ages continues to the overture of technology and progress, humankind is stuck in the middle waiting for one of them to lead. DeVilbiss 1 ...read more. This is the reason that currently the main commercial implementation of genetically modified technology has been to increase crop resistance to pesticide use. The main producers of GE technology, firms such as Monsanto, are also the world's main producers of pesticides and herbicides. This can be bad for the employee as they may have to take time off from work to learn and may be behind in what they are doing. But it can also be bad for the employer as they are losing money while the employee is training and also may have to pay for the training itself. How ATMs Work ATM works by providing users and clients with a remote access with their bank accounts. These machines are connected to the bank accounts through internet connection to the banks database where it has information on the amount of money in the account (Bowen, 2000). Diamond's account stated that European metalworkers created metal objects by "pouring molten alloys into shaped molds" (2). Diamond says that rapiers, represented a high point in a very sophisticated metalworking technology. her own, as different to others', professional personality, to fill her writings with her own personal touch, to express myself as a thinking being, a participant in society; and if my authorship is recognized, to know that it's not only because of my capacity to write but for what I have to say. With Roundup Ready soybeans growing to 81% of the totally soy grown within the United States in 2003 , one must ask why farmers are switching to GE soy. The reason for this is the lower costs of pesticides and herbicides. $20.8m In Africa the debt crises is so bad that around 315 million Africans live on less than $1 a day. The G7 minister are planning to cancel up to 100% of the debt owed, this would mean that around 37 developing counties would benefit from this proposed scheme. One of the famous traditional Chinese foods is Chinese rice dumplings, and it is made of sticky rice stuffed with different stuffing with lotus leafs cover around them. On the other hand, the cooking methods in the American diet were affected by the European countries.